We can do change….Did you hear about the Aussie who struck an attack helicopter with a garden mattock so that it couldn’t kill more people? Have you heard about his friend who helped him in this action? Do you know about the ongoing US military activity in Australia and that people just like you are working to put a stop to US led wars and Aussie involvement in them? Graeme Dunstan (the friend who helped) has amassed $164,000 in fines for “damaging” the helicopter. 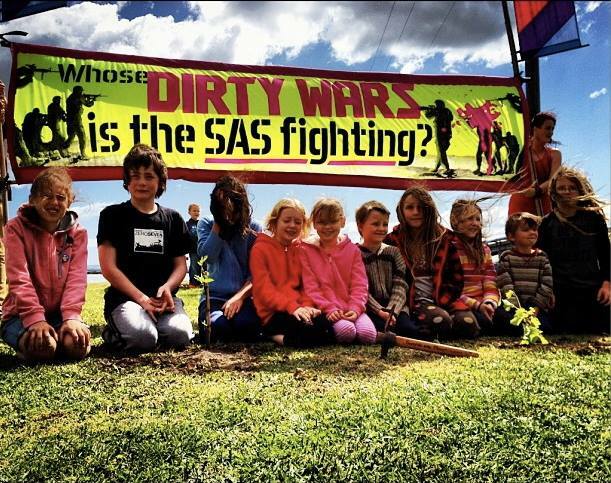 Others arrested opposing the Talisman Saber US-led war games in Queensland this year are still to face court. 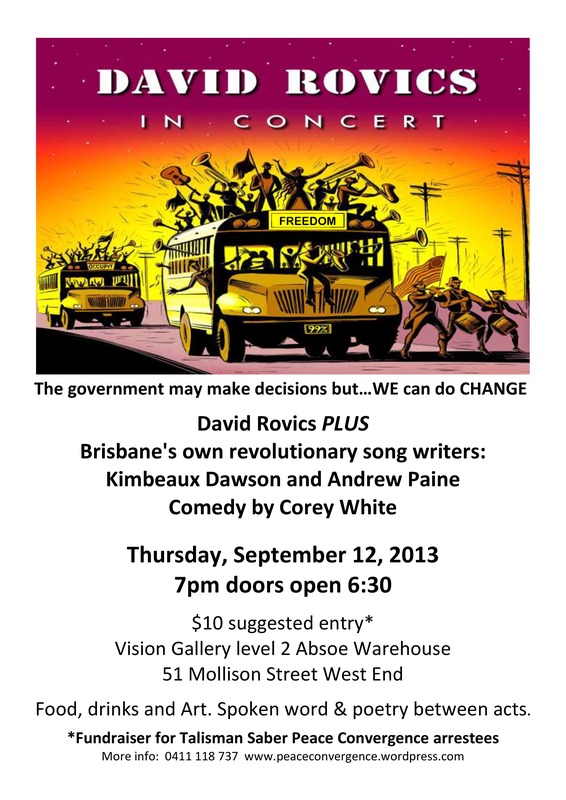 If you are not in Brisbane, listen to David’s songs and join us from wherever you are in action to close the bases – stop military exercises and – end the wars! More info: With the United States preparing for a war on Syria it is a timely reminder to us all that peace is what is needed on the planet. 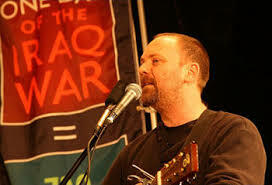 A Community Peace Event is taking place in West End, headlined by American singer/songwriter and long time campaigner for peace, David Rovics. The event also features local musicians Kimbeaux Dawson and Andy Paine, with spoken word and poetry between acts. Andy Paine was one of four people arrested in Rockhampton last month and is now facing charges alongside Jim Dowling, Robin Taubenfeld, and David Spriggs. 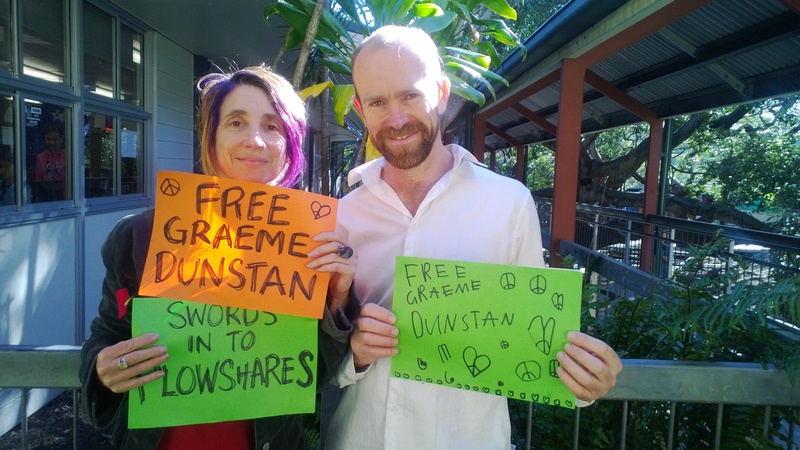 Also arrested recently for trying to disrupt the Talisman Saber war games were Graeme Dunstan and Brisbane activist, Greg Rolles. These people were brave enough to stand up against the ongoing expansion of the US military presence in our region. ‘We Can Do Change’ is inspired by these people and people all over the world who are saying enough is enough. This event is a way of supporting our local peace activists by raising funds for their ongoing legal costs. A $10 entry charge is suggested. 19TH AUG: ROCKY TIGER PLOUGHSHARES GRAEME DUNSTAN – FOUND GUILTY. SENTENCED TO TWO YEARS SUSPENDED. 3 YEARS GOOD BEHAVIOUR. $162,000 REPARATIONS FINE. Rev Simon Moyle and former human shield Donna Mulhearn attended the court as witnesses for Graeme. Talisman Saber is a US led military exercise that takes place every two years in Australia, primarily on the central coast of Queensland at Shoalwater Bay. Talisman Saber 2013 took place from 15 July to 5 August 2013. These biennial exercises are some of the world’s largest military exercises. 2013 involved 28,000 US and Australian troops (19,000 US and 9,000 Aussie) engaged in land, sea and air warfare practice. Talisman Saber involves live firing, the use of explosives, the practising of urban warfare, the use of high power sonar and active sonobuoys, amphibious assaults, parachuting and land force manoeuvres. US troops involved in these exercises deploy to or from real war situations, forward deployed units, or other military operations. This year, the US jettisoned four bombs on the Great Barrier Reef, when they had difficulty dropping them on their intended target, Townshend Island. While this drew media attention and international condemnation, these four bombs are just the tip of the iceberg as far as bomb drops and live firing involved in Talisman Saber and other US military training in Australia. Talisman Saber is one facet of an expanding US military presence in our region, and Australia’s support for it. Australia already houses Pine Gap (US satellite base), allows US bombing flyovers, stations US troops in Darwin, hosts nuclear powered and nuclear weapons capable war ships and opens both its civilian and military infrastructure to the US. With changing economic and political priorities, the US is repositioning its global force and Australia is playing a vital role in both acting as launching pad for US military activity, as an ally in the field, and as the face of the US nuclear umbrella in the Asia-Pacific region. Talisman Saber threatens our security by further entrenching Australia in US global military expansion. Talisman Saber war rehearsals must be stopped and Australia must refuse to collude with US global military expansion. The Peace Convergence encourages people to support our peace arrestees and take peace action in their own region or where ever war games and militarism are taking place. Graeme Dunstan (71) of the Rockhampton Tiger Ploughshares was found guilty of wilful damage to a Tiger Attack helicopter and given a two year suspended sentence on a three year good behaviour bond. This included $2000 reconnaissance and 162K in reparations however payment was not expected given Mr Dunstan’s financial circumstances. Judge Samios stated that the costs were not insignificant and he would have to take this into account when sentencing Mr Dunstan. The Tiger helicopter was $45 million and rendered inoperable for a period of 4 months. Mr Dunstan responded that four months out of action was a blessing to the world. 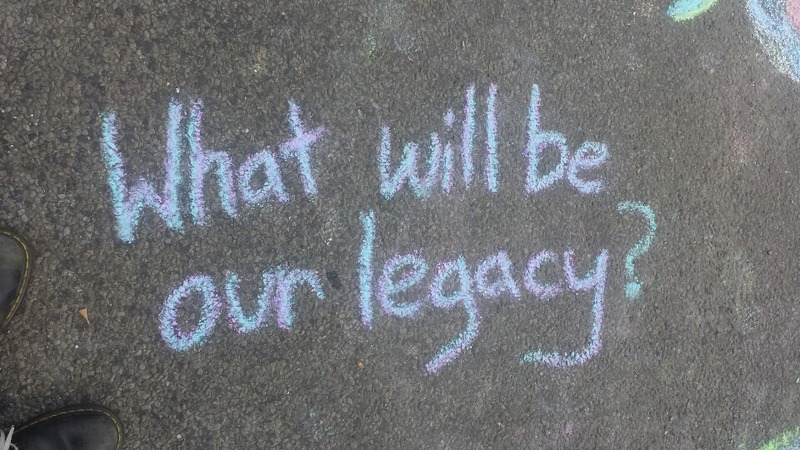 The Prosecution made submissions of a custodial sentence because of Mr Dunstan’s lack of remorse but also as a personal and general deterrent: to send a message to like-minded members of the community that deliberate acts of vandalism to government property would not be tolerated. Judge Samios whilst imposing a custodial sentence suspended it immediately. Jury deliberations went into the next day after a unanimous decision was unable to be reached with two of the ten jurors unconvinced of Mr Dunstan’s guilt. A guilty verdict was announced when court reconvened this morning. The jury viewed the footage, and heard related testimony from Australian peace activist Donna Mulhearn who had traveled to Iraq as a “Human Shield” in 2003. Reverend Simon Moyle also gave testimony about both Christian pacifism and the Ploughshare movement and his personal experiences in Afghanistan. Background: Mr Dunstan assisted the now deceased Bryan Law who rode a large red tricycle across the Rockhampton airport tarmac and disabled an Australian Army Tiger Attack Reconnaissance Helicopter in a creative act of disarmament. Mr Law used a garden mattock to deliver a blow to the military helicopter. The action was inspired by the biblical prophecy of ‘Beating Swords into Ploughshares’ meaning taking action to convert killing machines such as the Tiger helicopter into ploughshares or agricultural tools that promote life.